In another blow for Scott Morrison, a second Liberal woman in a marginal seat has declared she will not run at the next election. 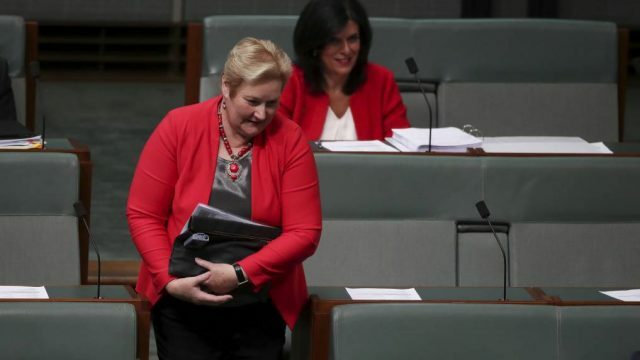 Ann Sudmalis, who holds the NSW regional seat of Gilmore on a margin of 0.7%, cited stacking, bullying and leaking against her, and denounced the state Liberal organisation. Her stinging attack on the NSW Liberal division has prompted action from the Prime Minister to have the party’s organisational wing investigate allegations. Morrison – who met with Sudmalis on Monday – said she had “raised a number of genuine concerns” with him about her treatment in her local Federal Electoral Conference within the NSW division of the Liberal Party. “This is in addition to complaints I have received from other colleagues about processes in the party’s organisational wing,” Morrison said. He emphasised the complaints did not relate to the parliamentary wing, but to the party’s organisational wing. The Minister for Women, Kelly O’Dwyer, said earlier this month that such a process was needed in the wake of the recent allegations of bullying. Sudmalis’s announcement follows Victorian backbencher Julia Banks’ decision to also quit at the election, citing bullying. Her Victorian seat of Chisholm is on about 3% after the redistribution. Without the well-known incumbents, both seats will be harder for the Liberals to hold. Sudmalis stressed her decision “has nothing to do with the leadership of Scott Morrison nor my federal colleagues”. She described Morrison as a friend and a man of integrity who was “absolutely passionate about the long-term progress and vision for Australia”. “I am concerned that the media will interpret my decision as a reflection on the leadership of Scott Morrison. If they do, they will be lying. Scott Morrison truly is a good man,” she said in a statement. She said that she had endeavoured to keep her decision private until after the Wentworth byelection but this wasn’t possible. “I have asked the Prime Minister to acknowledge that I am withdrawing my nomination,” she said. She said her decision “has everything to do with the NSW State Division and the actions of one of my state Liberal colleagues”. When her preselection was obviously coming under pressure earlier this year, Turnbull and Morrison strongly backed her. It was reported at that time that party powerbroker and NSW Liberal MP Gareth Ward was behind the campaign against Sudmalis. Sudmalis, 63, entered parliament in 2013. She had a 3% swing against her in 2016. Sudmalis launched an extraordinary attack on state Liberal Gareth Ward, declaring that “bullying, betrayal and backstabbing” had been his hallmarks over six and a half years. She said since she was preselected in 2012 Ward, who is the member for Kiama, had leaked against her “and more recently he approached friends asking me to nominate my retirement date and then he’d call off his people”. He had stacked her branches and rolled her supportive FEC committee, installing people who had never been part of a federal campaign. ‘This is not the first time that Gareth has flexed his vengeance on strong Liberal women. He doesn’t just get even, he annihilates anyone who opposes him”, she told the House of Representatives on Monday night. “In 2016 Gareth worked the numbers and denied a priority position for a strong Liberal woman Kellie Marsh, a local and effective councillor. She ran independently and won a place on the Shellharbour Council. “That same year Gareth, while helping his friend Andrew Guile get back on to the Shoalhaven City Council, worked on the booths handing out for the independent team, knowing their preferences for the mayor would all go to the Greens candidate and not to Jo Gash, also a strong Liberal woman. Despite her winning the primary count she was defeated. “Then when nominations were called for the seat of Gilmore, Gareth’s friends Paul Ell and Adam Straney strangely decided to nominate against me, while Andrew Guile actively encouraged Grant Schulz to do the same,” Sudmalis said. “Was I doing a lousy job? No. … Was it because they thought I’d lose the last election? “Hardly. When I had the confidence of the former Prime Minister Malcolm Turnbull and the current Prime Minister, Scott Morrison, openly stating on national television their support for me.